Trulite Glass & Aluminum was one of the first fabricators to commit to green best practices in its manufacturing plants and through innovations in product design. Trulite is an industry leader in environmental responsibility, recycling as much as 90 percent of plant waste materials, utilizing energy efficient glass tempering ovens and converting to powder coat paint systems to significantly reduce VOC emissions. With locations nationwide, Trulite provides the industry with a one-stop destination for all green resources related to the glazing and aluminum products industry. For more than three decades, Trulite has maintained a corporate philosophy of balancing the demands of a Profit & Loss Statement with the task of preserving our environment. We have a documented history of sustainable manufacturing practices, including the use of energy saving technologies, materials conservation and recycling, even before it was fashionable. We have always designed our products with energy efficiency in mind. As the trend toward sustainability moves toward reduced carbon emissions and energy zero buildings, Trulite will be there for you well ahead of the competition. Not because we like being first, even though we do, but because it’s the right thing to do. 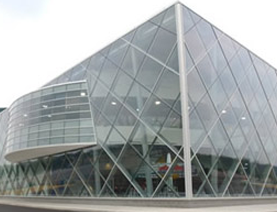 The latest advances by Trulite in high performance glazing can significantly enhance a building’s energy efficiency, improve the interior climate for occupants and minimize the impact a structure has on its natural surroundings. Innovations in Trulite glazing and extruded aluminum products provide building owners with lower heating and air conditioning loss, maintain a tighter enclosure, and offer window surface temperatures that improve comfort and minimize condensation, which can be a potential source for mold and mildew. These high-performance windows feature double or triple glazing, specialized transparent coatings, Low-E interlayers, insulating gas sandwiched between panes, and improved thermally-broken structural framing. All of these features reduce heat transfer, therefore, reducing heating and cooling loads. As a True Single Source supplier of glazing needs, Trulite offers high-strength, lightweight aluminum extrusion to virtually any custom design with excellent thermal properties. It’s hard to believe that two materials so apparently opposite as aluminum and glass could have anything in common. But both of these popular building materials require a complex and energy intensive manufacturing process and both require depletable natural resources. Fortunately, both materials are also totally recyclable. In general terms, the environmental impacts of recycling are incredible. Every year, recycling saves enough energy to power 1.4 million homes, reduces water pollutants by 27,047 tons and also helps to reduce air pollution. Recycling a simple 6-inch piece of Trulite channel can save enough electricity to power a TV for more than three hours. Recycling the glass from a typical Trulite shower or standard size window can save enough energy to power a computer for more than 30 minutes.